NARA M1372. 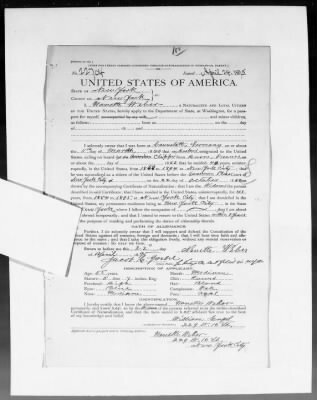 Images of handwritten letters and application forms for U.S. passports, 1795-1905. NARA M1372. Letters and form applications for U.S. passports. An application may include supporting letters and affidavits from friends and relatives concerning the applicant's citizenship, residence, and character. It also may contain information regarding the applicant's immediate family, date and place of birth, occupation, physical characteristics, and (if foreign) of naturalization. Images are ordered by the surname initial, then by application date, yet not alphabetically beyond the surname initial.